Excuse the poor photo quality - but appreciate the amount of food for 8pp! Don’t automatically rule this recipe out because it’s beef – I know as students, it’s easy to think you can’t afford meat apart from chicken, but the fact it’s stewing steak really keeps the cost down. Our beef was £4.30 in Morrisons, but that makes 4 meals, and everything else with it is cheap. We’ve also used a fair amount more vegetables than the original recipe, because it bulks out the meal for no propoints and little extra expense. Feel free to use more or less depending on your preference. 1. Sear the steak in a hot pan, so that the edges brown off. Make up the stock and chop the vegetables at the same time. 2. Add the onions, carrots, leek and stock, bring to the boil and season with salt and pepper. Reduce the heat and simmer for 2 hours. 3. If making your own carrot and swede mash, begin boiling the carrot and swede now – it’ll need between 10 and 20 minutes. If using shop bought, simply follow the instructions so that it’ll coincide with the stew being finished. 4. Add the potatoes to the stew and cook for a further 20 minutes. 5. Add the peas to the stew, and cook for 3-4 minutes. While the stew finishes up, stick 1 yorkshire pudding per person into the oven, and mash/serve up the carrot & swede mash. 6. 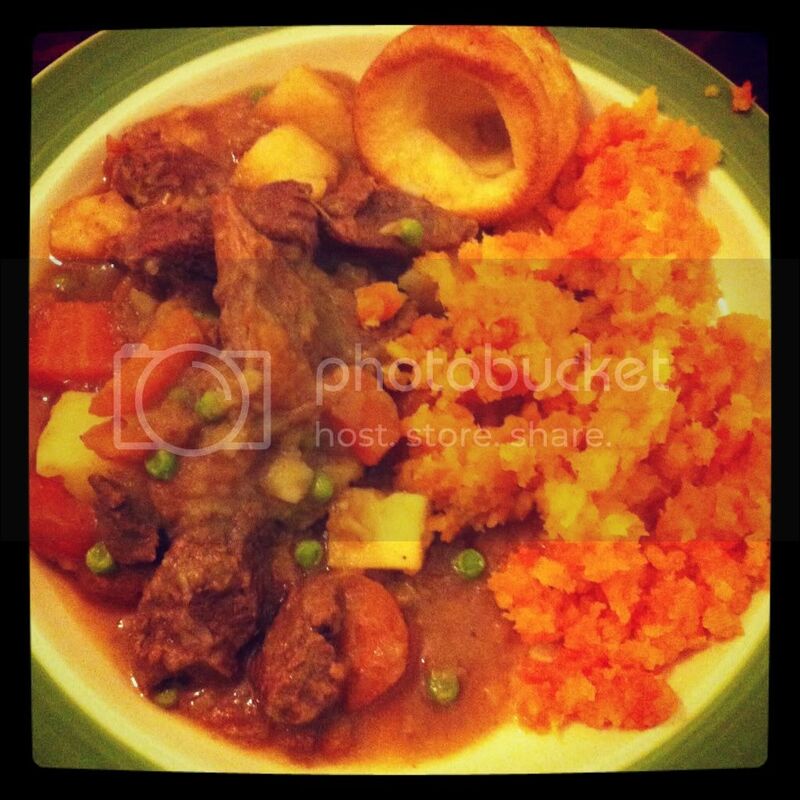 Serve each person with ¼ of the stew, as much carrot & swede mash as they like, and 1 yorkshire.